90% of companies don’t effectively implement their strategies, because of a lack of a effectively implemented strategies, business processes and objectives throughout the entire organization. Group50® brings highly skilled operating professionals who are experts in strategic execution to every project we undertake with the flexibility to support a client as consultants, advisers, coaches, board members and interim executives. Group50 has developed unique Strategic Execution, Change Management and Performance Management tools for doing that. We believe that sustaining high levels of performance and developing a culture of strategic execution is driven by clearly articulated strategies, optimized business processes and objective setting. It is no more complex than that. 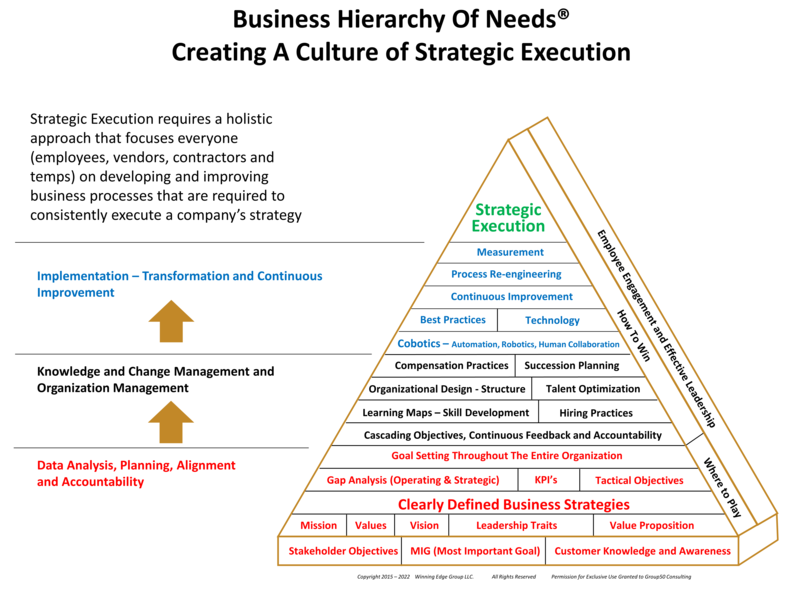 As we work on projects with our clients, we rigorously test our activities against the Business Hierarchy of Needs® , a framework developed by Group50 and applicable to any organization, industry or group. Regardless of the size or complexity of the project, we work with our clients to identify strategic and operational gaps inside the company, design solutions to deal with then and work closely with various teams in the organization through the implementation. We couple our work with unique methodologies, software tools such as Cascade and over 40 assessments and workshops that are part of our Company Physical®. All of these have been developed with the functional expertise of our consultants delivering project results that are sustainable and scalable. We routinely deliver an ROI that is greater than 10x. Group50 consultants have the functional and technical experience to work with our clients in any area of our Business Hierarchy of Needs, assuring them that our combined efforts will realize superior results throughout their business. Our clients can rely on us to provide continuing support on any project, in every area of their business, because we don’t like projects that don’t include implementation components. Talk to an expert in Strategic Execution and Change Management at (909)-949-9083, send us an email at info@group50.com, or request more information here.